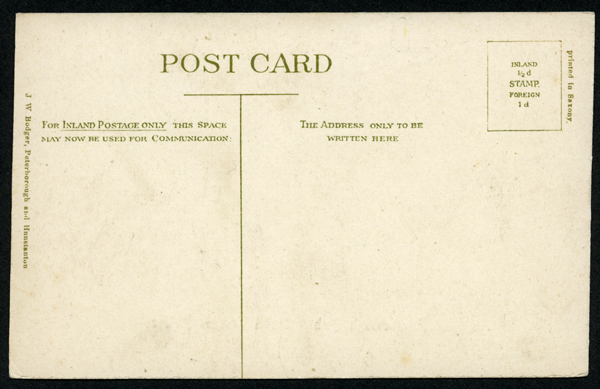 Subjects, styles, advertising, other relevant information: Postcard publisher. 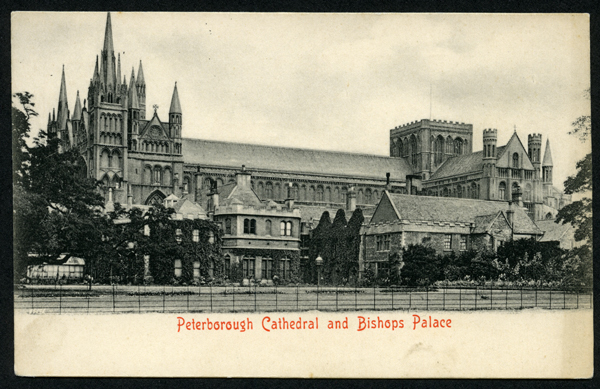 See below an example from the author's collection of a postcard view of Peterborough Cathedral and Bishops Palace. 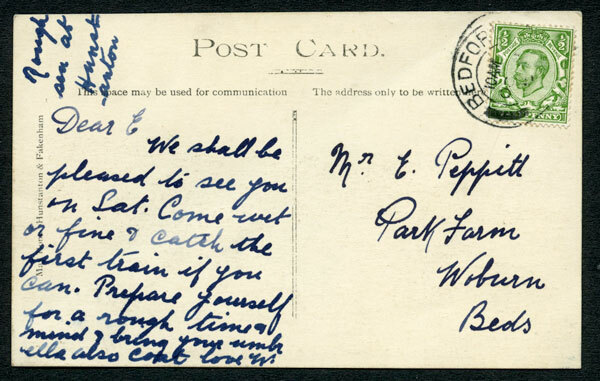 The reverse contains the text "J W Bodger, Peterborough and Hunstanton" c 1910-20. References: Anthony Day, "Fen and Marshland Villages. A Portrait in old photographs and picture postcards". SB Publications 1993 ISBN 1 85770 041 4 at p79 shows a street scene from Thorney dated 1910 with the name "J.W.Bodger, Peterborough and Hunstanton" on the face. 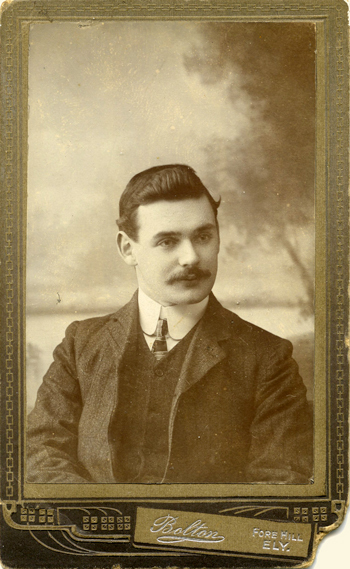 John Bodger is recorded as a chemist at 5 Broadway Peterborough in the 1901 Census. He is also shown as a chemist at Royal Parade, Greevegate Rd Hunstanton in Kellys Directory of Norfolk 1912. 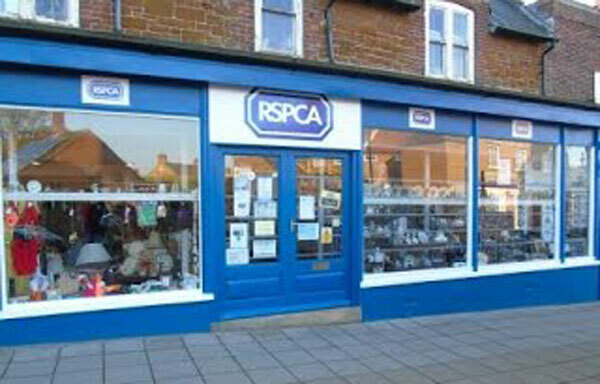 His Hunstanton premises are believed to be the current RSPCA charity shop in Greevegate, shown below. Thanks to local historian Tony Gale for making the connection. The Peterborough Advertiser, 10/8/1912 p2 has a photograph of Ramsey Abbey, captioned "Photo J.W.Bodger (Peterborough) postcard series". 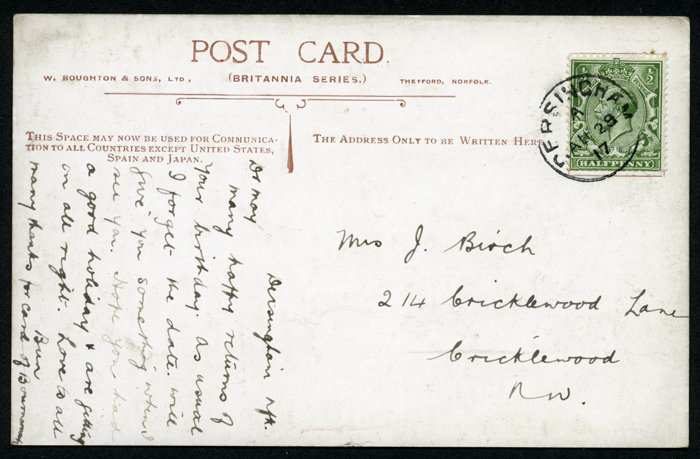 This suggests that John Bodger was a photographer as well as a postcard publisher. BOLTON and CHURCHYARD, c.1901, Market Place Ely. See below Thomas Samuel BOLTON. Subjects, styles, advertising, other relevant information: In 1881 Samuel was working as a rural letter carrier living with his wife Martha in Ely. When he married Martha at St Barnabas Church, St Lukes Parish, Islington, Middlesex, he was working as a post messenger. His wife was described in 1881 as a photographer so she seems to have preceded him in the photographic business. Ely, Kellys 1883-1888 – the business was continued by his wife Martha after Samuel died in 1888, then by his son Thomas Samuel Bolton. A newspaper report on an exhibition of the photographs of Tom Bolton at Ely Museum states that Samuel Bolton started a photographic business at the foot of Fore Hill in 1863 (Ely Standard 26 Sept 1991). Confirmation of this early start date has not yet been found. 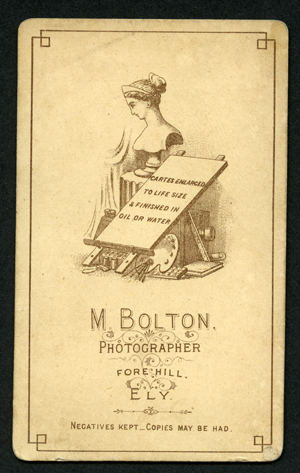 Subjects, styles, advertising, other relevant information: Son of Martha Bolton above, joined her in the business which traded in 1897 as M and T Bolton. Three images from the firm were registered at Stationers' Hall to preserve copyright. The first submitted on 28/7/1897 was a photograph of Jubilee Celebration, Ely, 1897. Copyright owner of work: Martha Bolton and Thomas Bolton. M & T Bolton, Fore Hill, Ely. Copyright author of work: Thomas Bolton, Fore Hill, Ely. Form completed: 28 July 1897, TNA COPY 1/431/452. The second and third submissions were photographs of the Lord Bishop of Ely. 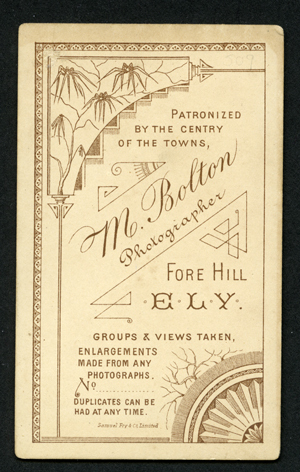 Copyright owner of work: Martha Bolton, Fore Hill, Ely, Cambridge. Copyright author of work: Thomas Bolton, Market Square, Ely, Cambridge. Forms completed: 16 August 1902. TNA COPY 1/456/418 and COPY 1/456/419. 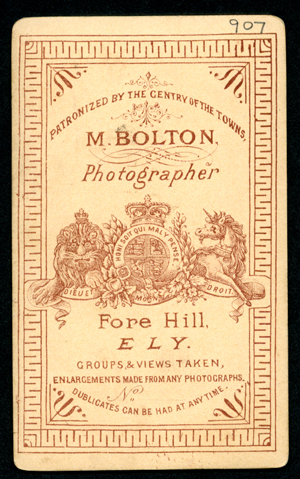 A newspaper report on an exhibition of the photographs of Tom Bolton at Ely Museum in 1991 states that Samuel Bolton, Thomas Samuel Bolton's father, started the family photographic business at the foot of Fore Hill in 1863 . Confirmation of this early start date has not yet been found. The same article states that by the early 1900s Tom Bolton was already in business himself as BOLTON and CHURCHYARD on the Market Place at Ely and that by 1907 he moved back to his father's old studio on Fore Hill. (Ely Standard 26 Sept 1991). The 1901 census shows Thomas S Bolton resident at 28 Market Place Ely, occupation, photographer and picture framer. At the same address was Henry E CHURCHYARD b. 1876, Ipswich, ironmonger and shopkeeper. By 1911 Henry Elliott CHURCHYARD (1877-1944) was resident in the High Street Ely, still a shopkeeper, but by this time a tobacconist. At the same address was his wife Rose Hannah Churchyard b.1881 Ely, a fancy goods dealer.Rose Hannah Churchyard was in fact the sister of Thomas Samuel Bolton and Henry and Rose were married in 1910. Henry Elliott Churchyard was still a tobacconist in Ely in 1916 when he unsuccessfully claimed exemption from service in the armed forces (Cambridge Independent Press 22 Dec 1916). He was a tobacconist in Ely, and his wife was a fancy goods dealer in 1939. It is not known at this time whether Henry Elliott Churchyard was a photographer or whether a business trading as Bolton and Churchyard in 1901 were ironmongers, photographers and framers, with the two partners in different parts of the business. 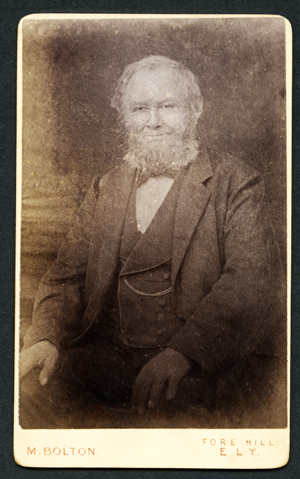 Thomas also became a publisher of local postcards. 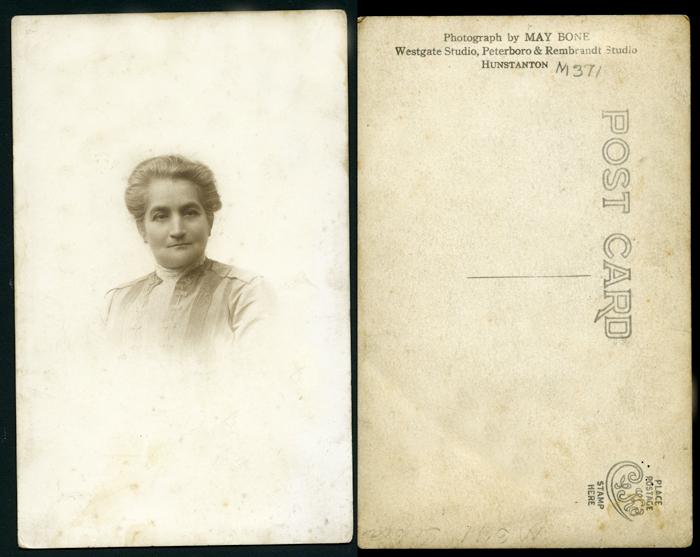 Below are two examples of T Bolton real photograph postcards (author's collection) c.1901, divided backs but no stamp boxes, below which are details of the firm's overstamping on the reverse, possibly made with rubber stamps. 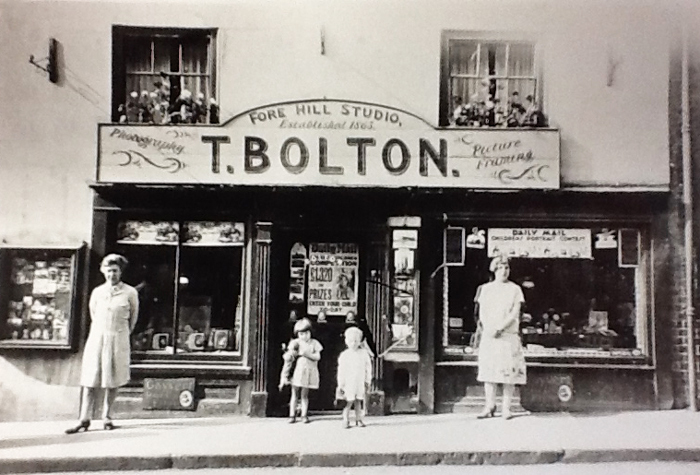 Next is a photograph of the shop front of Bolton's Fore Hill Studio, Ely, reproduced by permission of the Cambridgeshire Collection, catalogue ref Y.Ely.K3.41695. Note the sign board outside the premises states that the studio was "Founded 1863". This refers to the studio rather than the firm and earlier occupants were the Bradley family and then Bradley and Bolton. 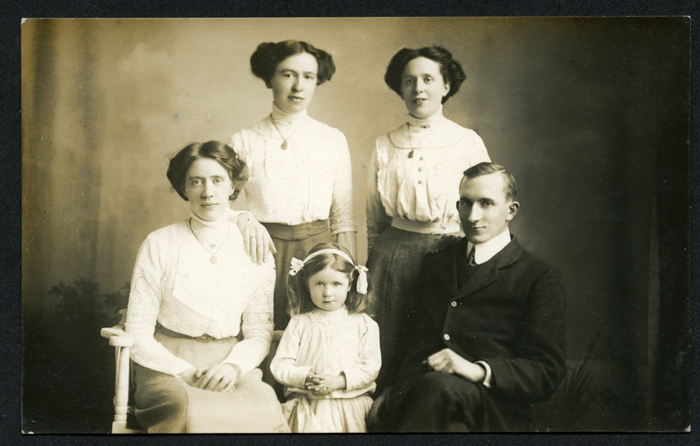 Next is a real photo postcard from the author's collection, with a family portrait - mother father, three children and a nannie, taken outdoors. Reverse printed in green "T Bolton Market Square Ely". 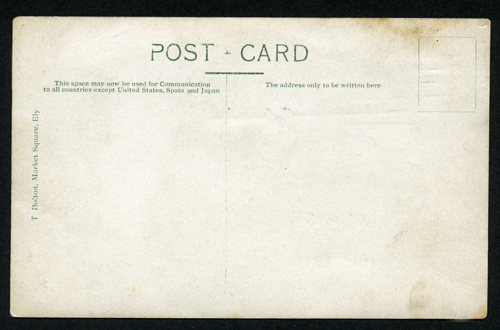 The back contains information about US, Spain and Japan not permitting the use of a divided back, dating this card to around 1907. Kellys Directory of Cambridgeshire 1904. Traded until his death in January 1943. Address: 5, Market Place Peterborough, 62 Westgate, Peterborough. (dates for changes of premises not currently known.). Other addresses in Norfolk. Subjects, styles, advertising, other relevant information: In the 1891 census May, aged 14, was living with her parents at Norwich St, Fakenham, Norfolk. Her father, Richard H Bone, was a watchmaker and jeweler. At the age of 14 May was a photographer's apprentice. 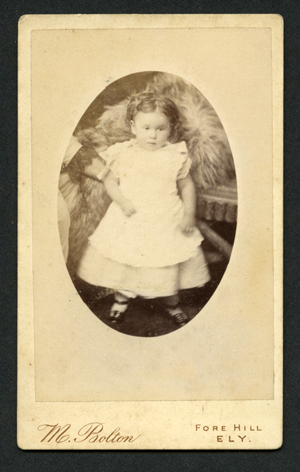 By 1901, May was still with her family at the same address but was a photographer working on her own account. May Bone later had studios in Norfolk at Norwich Road, Fakenham, Beach Road Hunstanton (at least as early as 1908), and Red Lion Street, Aylsham. It would appear that May attempted to open a studio in Peterborough in 1916, having struck a deal with John Borrill Etches to take over the stock in trade and goodwill of The Rapid Photo Co in Narrow Street. Something went wrong after agreement was reached. The Nottingham Journal on Wed 12 October 1921 p2 carried a report "A BREACH OF CONTRACT. Mr Justice McCardie, in the King’s Bench Division yesterday heard an action brought by Miss May Bone, of Market Place Peterborough against Mr. John Barrett (sic) Etches, of Narrow Street, Peterborough. claiming damages for, and an injunction against, breaches of the terms of a covenant to sell the stock-in-trade and connection of the Rapid Photo Co., of Narrow Street, Peterborough to the plaintiff in April 1916. His lordship found a clear breach of contract, and assessed the damages at £150, refusing a stay of execution." 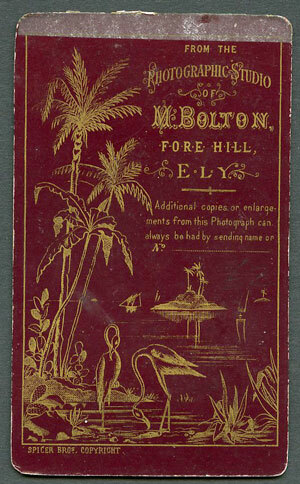 In addition to portrait work she also produced local topographical postcards - an example below is from the author's collection. After her death the Peterborough Studio was run by a John Rozelar for several years, but it was purchased in 1957 by Thomas Howell and became part of the Campkins business. 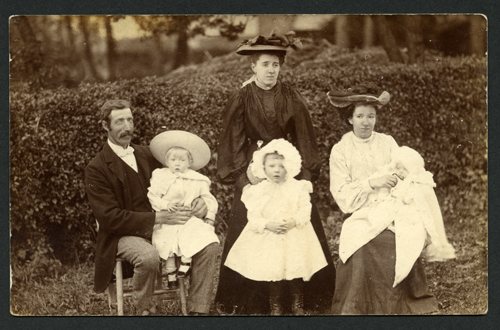 See below for a sepia toned family portrait, unknown family, postcard format, c.1910, by May Bone when she had studios at Hunstanton and Fakenham (author's collection). Next is a vignette portrait of a lady, the reverse carrying May Bone's addresses at Westgate Studio Peterborough and Rembrandt Studio Hunstanton. 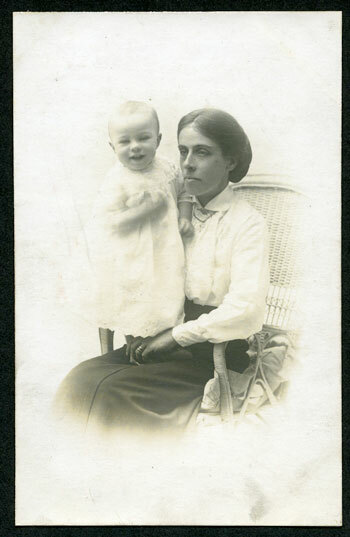 Below this is another postcard print of a similar period of a mother and child. On the reverse is printed "Photograph by May Bone 63 Westgate and 5 Market Place Peterborough also at Rembrandt Studio Hunstanton. Extra Copies can be obtained"
Subjects, styles, advertising, other relevant information: Annie Bossett is listed as a single woman a "Photographer Assistant (Developer Printer)" in the 1939 Register. There is no indication which Peterborough studio employed her. 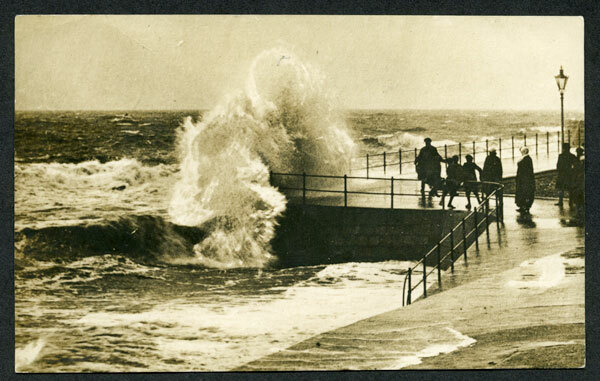 Subjects, styles, advertising, other relevant information: Walter Boughton and Sons were enterprising photographers operating in Norfolk and Suffolk. Details can be found on Robert Pols excellent site www.early-photographers.org.uk. In Norfolk the firm operated in Thetford 1883-1912, Yarmouth 1896, Norwich 1900 and Kings Lynn: High St 1901-08. In Suffolk the firm had premises in Lowestoft and later briefly in Ipswich: 106 London Rd Lowestoft 1892, 54 London Rd Lowestoft 1896-1916. 24 Buttermarket, Ipswich 1900-01. In 1900 the firm was expanding. The Ipswich Journal of 2nd June 1900 reported that local photographer Walter Boughton had taken on a photographic business from a Mr Dupres (or Duprez) at 24 Buttermarket, Ipswich, having been persuaded by Dupres that it was a going concern which he was only selling because he was emigrating to France to be with his fiancee, but which turned out to be a moribund business involved in a property dispute. It would appear that as an alternative, the firm expanded into Peterborough briefly, taking over the Cathedral Studio from printer and publisher George Caster, and later relinquishing it to photographer A.F.Healey who was shown as its occupier in the 1901 census and who's entry in the local directory for 1905/6 described his firm as "Late W Boughton & Sons". It would seem that the members of the Boughton family involved in running the business were brothers Thomas R Boughton b: 1869 Thetford and Walter Boughton b:1873 Thetford. Their father, Walter Boughton b: 1842 Norton Suffolk, was listed in the census returns for 1881, 1891 and 1901 as a builder, presumably his primary occupation. 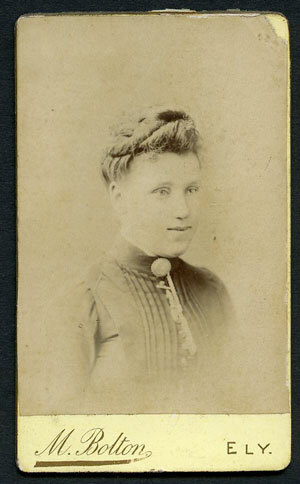 See below a carte de visite from the author's collection, a vignette close up of an unknown lady, possibly an outdoor portrait, on the face is impressed "W Boughton and Sons, Cathedral Studio, Peterborough". Next are two Cabinet photographs on slightly different mounts. 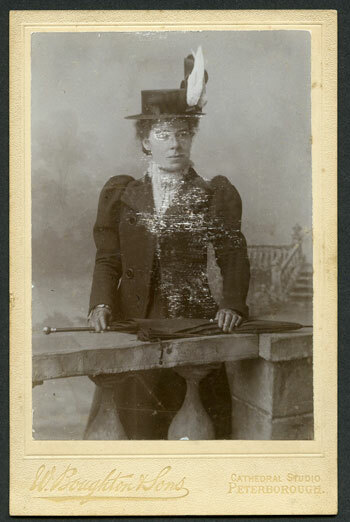 The one on the left of an unknown lady in a hat, c. 1900, negative no in pencil on reverse is 2159, is on a buff mount with square corners, impressed line around the image and "W Boughton & Sons Cathedral Studio Peterborough" impressed on the face. The underlining on the name is horizontal. 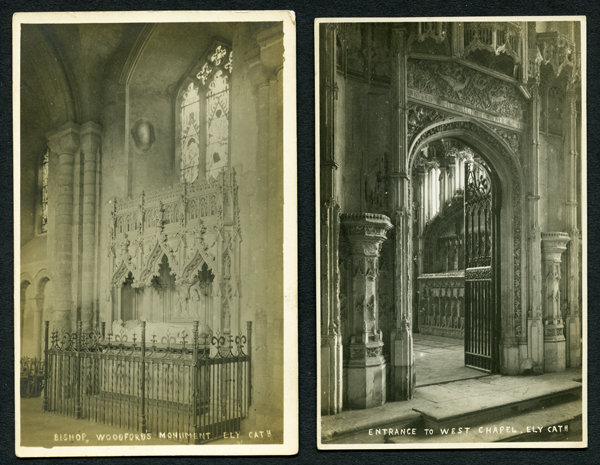 The photograph on the right is on a cheaper buff mount with rounded corners, The underlining under the firm's name is ascending from left to right and the studio name is in a gothic typeface. Both of the cabinet photographs have plain reverse sides. Both have scratched even while preserved in an album. 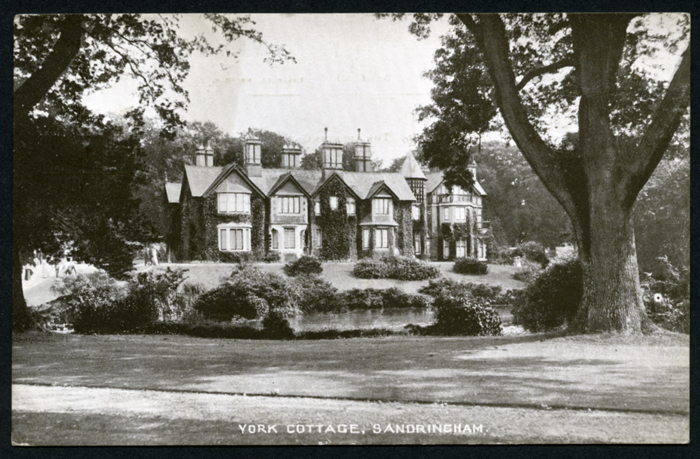 Below this is an example view postcard of York Cottage Sandringham (part of the Sandringham Royal Estate), one of the Britannia Series of postcards produced by W Boughton and Sons Thetford. 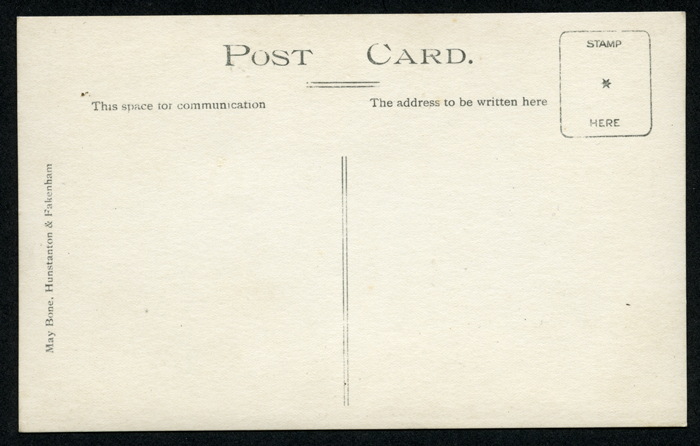 This was postally used in 1917. 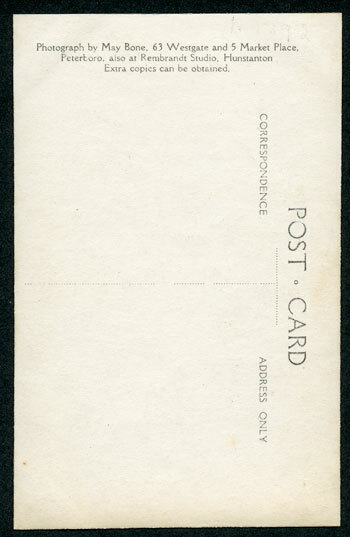 Subjects, styles, advertising, other relevant information: Produced local postcards. In the 1939 Register shown as a photographer on his own account, living with his wife Madeline, b: 1868, at 83 Garton End Road, Peterborough. 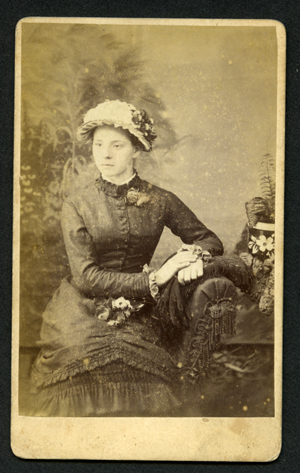 Subjects, styles, advertising, other relevant information: In 1871 Henry Bowser was in South View, Winchester working as a photographer and lodging with another photographer, Edgar Gyngell. The 1881 Census shows Henry as a photographer at 13 Lynn Road, Wisbech, living with his wife Julia, b. Winchester 1855. By 1891 they had moved to Norton in County Durham where he was still a photographer, self employed. In 1901 they had moved again to Brighton, where Henry was still shown as a photographer. From our entry above it would appear that Henry Bowser was, for a while, in partnership with two other Wisbech photographers, trading as Beales, Bowser and Kennerell at 8 High Street, Wisbech. Subjects, styles, advertising, other relevant information: In the 1911 Census Sidney Bowyer was listed as a photographer's assistant. He was living at home with his parents three sisters and brother. His parents ran a milk selling business. It is not known at this stage for whom he worked. References: 1911 England Census. 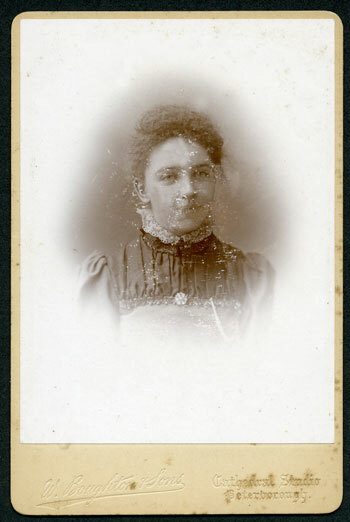 Subjects, styles, advertising, other relevant information: In the 1911 Census Walter was listed as a photographer working on his own account from home. 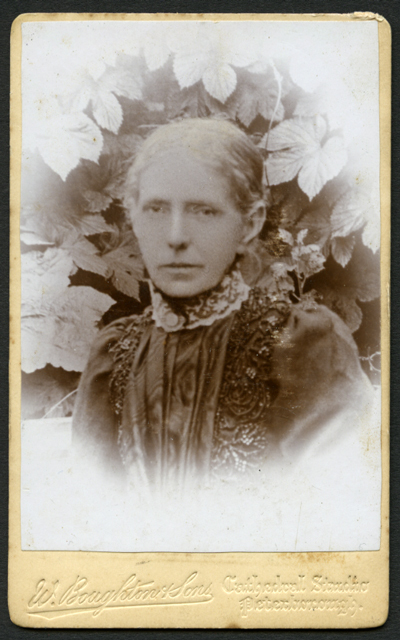 He was living in a 2 room dwelling in North Street Burwell with his wife Nellie Boyd b:1884 Islington, a travelling actress. 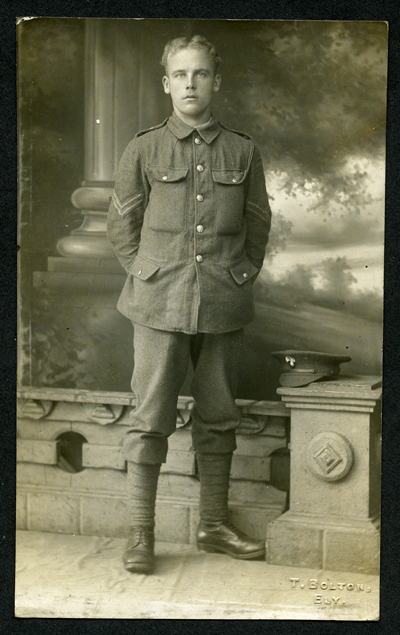 They had a son, Leopold James Boyd b:1908 Wimborne Dorset.